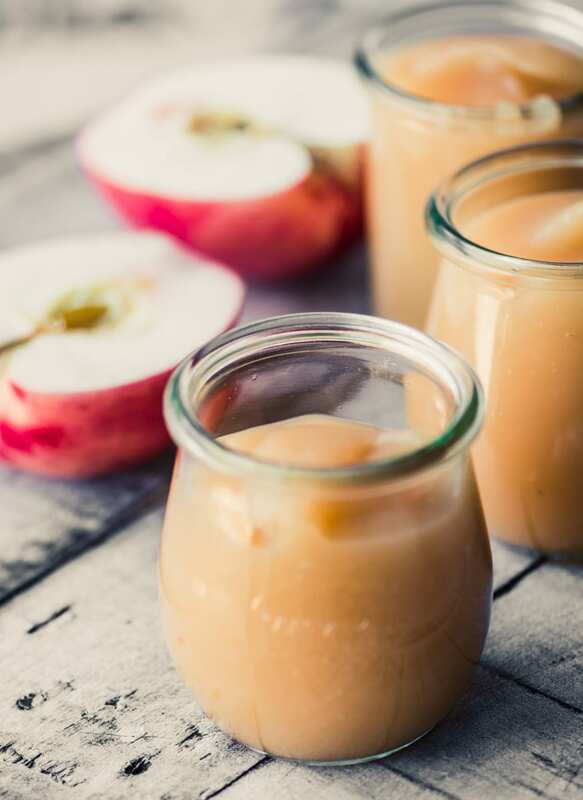 One Hour No Sugar Apple Butter ~ this healthy small batch fruit butter has the flavor of fresh apples with just a hint of spice, and best of all, it’s ready in an hour! I made this quick small batch apple butter with some beautiful apples I picked last weekend while visiting with my daughter in Madison. The orchard we went to (Appleberry Farm, in Cross Plains Wisconsin, if anyone lives nearby) grows over 20 different apple varieties, including heirlooms like Pink Pearl, Sheepnose, and Pitmason Pineapple! 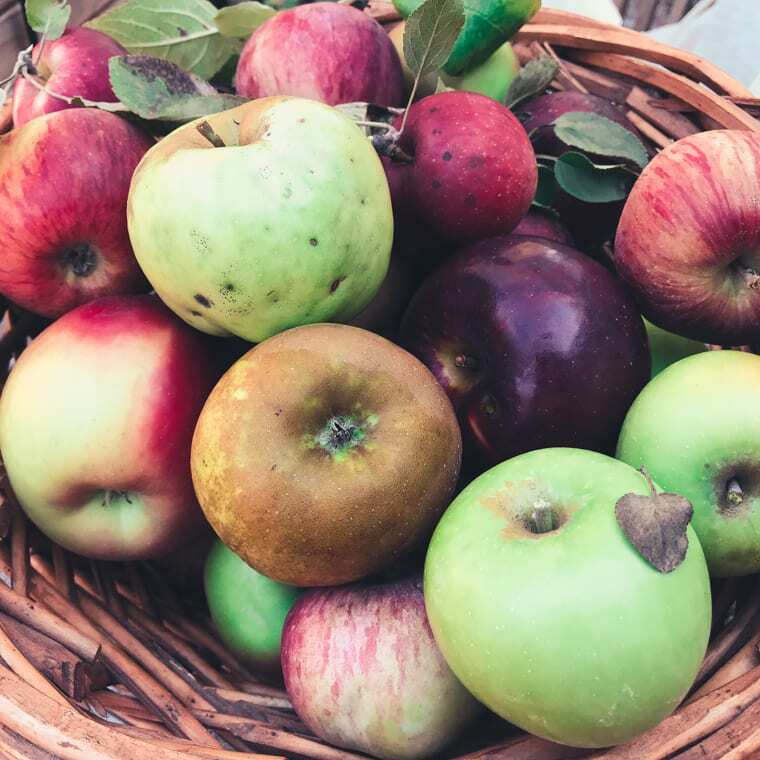 It’s such fun to see and taste all the subtle differences in these unusual apples, especially if you’re used to the limited supermarket selection. 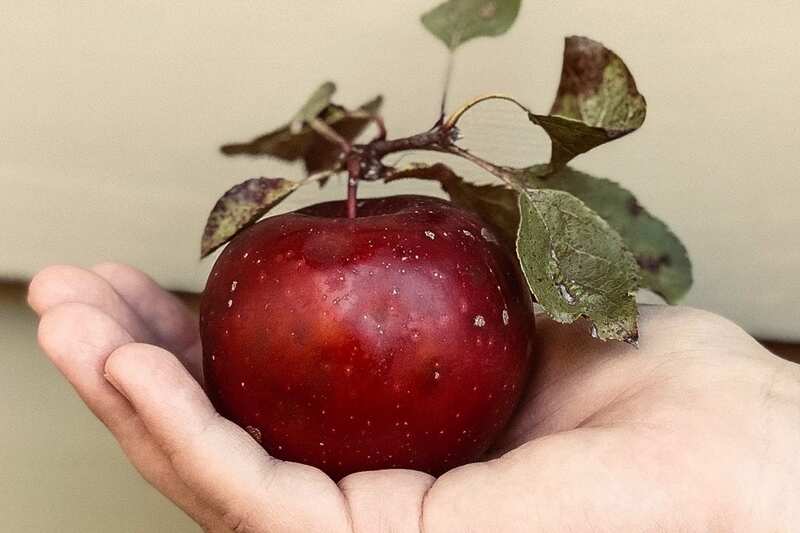 Do you know a Pippin from a Northern Spy? Luckily, when it comes to apple butter, it really doesn’t matter, you can use any apple you like. I used a random mixture for my butter, and every batch will be a little different depending on the variety you use. TIP: The butter is done when you can drag your spoon across the bottom of the pan and leave a trail without any liquid filling it in. Another test: remove some with a spoon and if the butter remains mounded without spreading, it’s done. This particular apple butter has a fresh apple taste and is pale in color. That’s because I didn’t add a lot of extra liquid to the apples, so they cook down quickly. I used whole spices to infuse their flavor into the butter rather than adding ground spices directly to it, which would result in a darker butter. Love the flavor of fresh apples? Try my French Apple Jam. 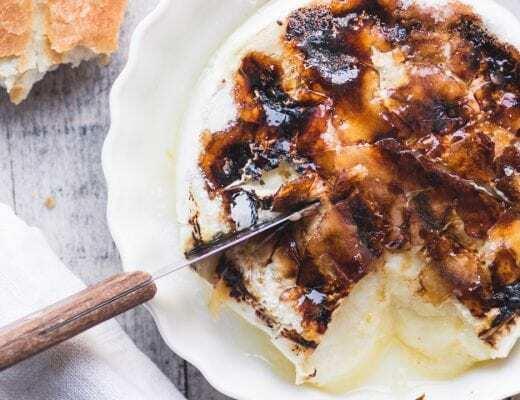 TIP: If you want more of the classic dark spiced apple butter, increase the cider to 1 cup, add 1 cup brown sugar, 2 Tbsp of molasses, and ground spices rather than whole. You will need to cook it longer to get to a thick spreadable consistency. 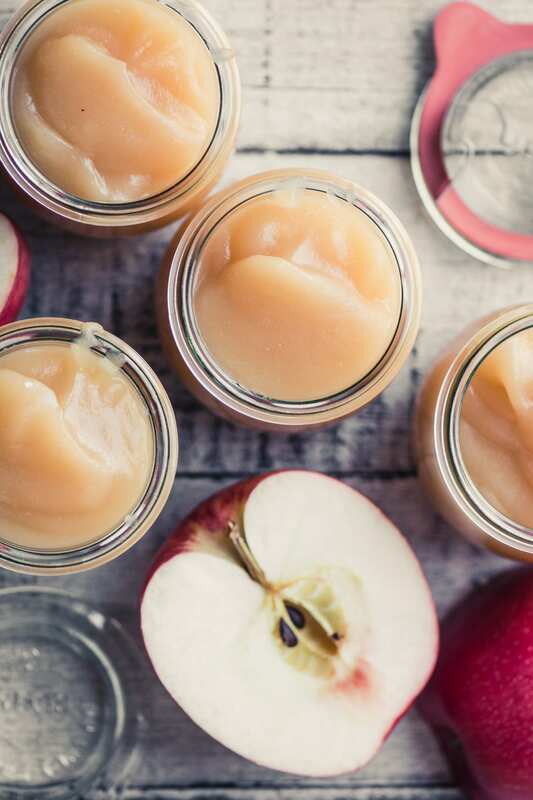 Making apple butter is such a fun fall project! Try my Cranberry Apple Butter for another delicious no-sugar fruit butter variation. If you choose to leave the peels on your apples, you will want to wash them well. The latest research shows that a 1% solution of baking soda/water does the best job of removing pesticides. 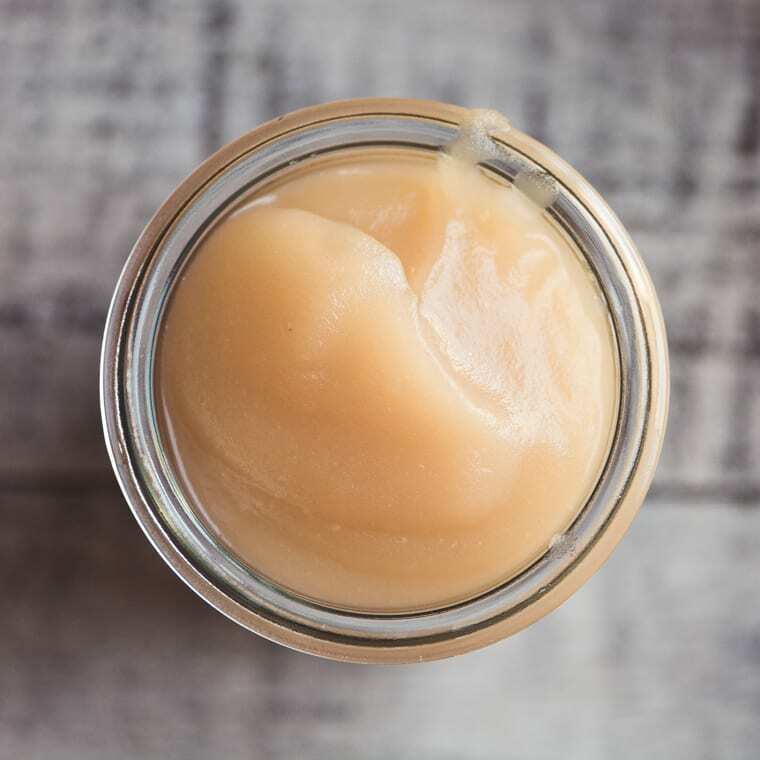 One Hour No Sugar Apple Butter ~ this healthy small batch fruit butter has the flavor of fresh apples with just a hint of spice, and best of all, it's ready in an hour! Put the apples and cider in a large heavy bottomed pot. Tie the whole spices up in a cheesecloth bundle and add them to the pot. Bring to a boil, then cook, uncovered, for 20 minutes, stirring occasionally. Remove the spice sack, and puree the apples in a high speed blender or food processor. Work in batches, if necessary. Return the puree to the rinsed out pot, and continue to cook for 10 to 15 more minutes, stirring often, until thick. I add the spice sack back in at this stage. Note: the butter will sputter quite a bit, so covering the pot with a splatter screen helps. The butter is done when you can drag your spoon across the bottom of the pan and leave a trail without any liquid filling it in. Remove the spice sack, and fill a jar or jars. Let cool before capping and refrigerating. 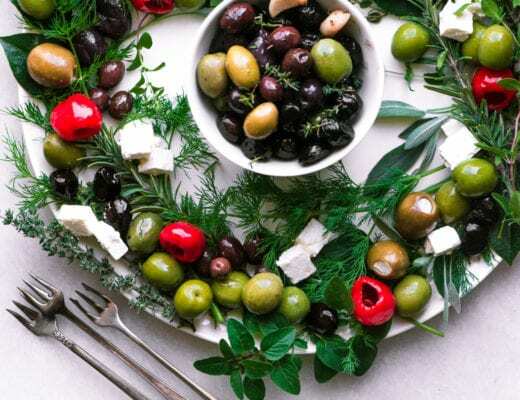 Plan to consume within 2 weeks, or freeze for longer storage. If you like things a little sweeter, add some sugar, or brown sugar, to the pot with the apples and cider. If you want a spicier butter, try using ground spices, start with 1/2 tsp of each cinnamon and allspice, with 1/4 tsp of nutmeg and cloves. Add more to taste. Leave the peel on for added flavor, color, and texture. Thanks for pinning this one hour no sugar apple butter! Oh gosh, Sue, your photos and recipes are in the stratosphere now! 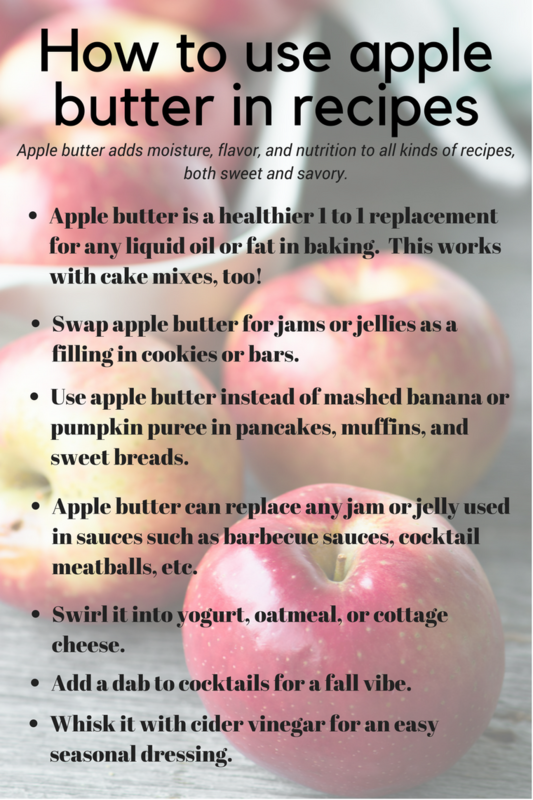 I love this post so much – those apples, that easy, healthy butter – fantastic. Each time I visit you I’m reminded why I started stalking your blog 5 years ago, haha. You’re a sweetie, and right back atcha! 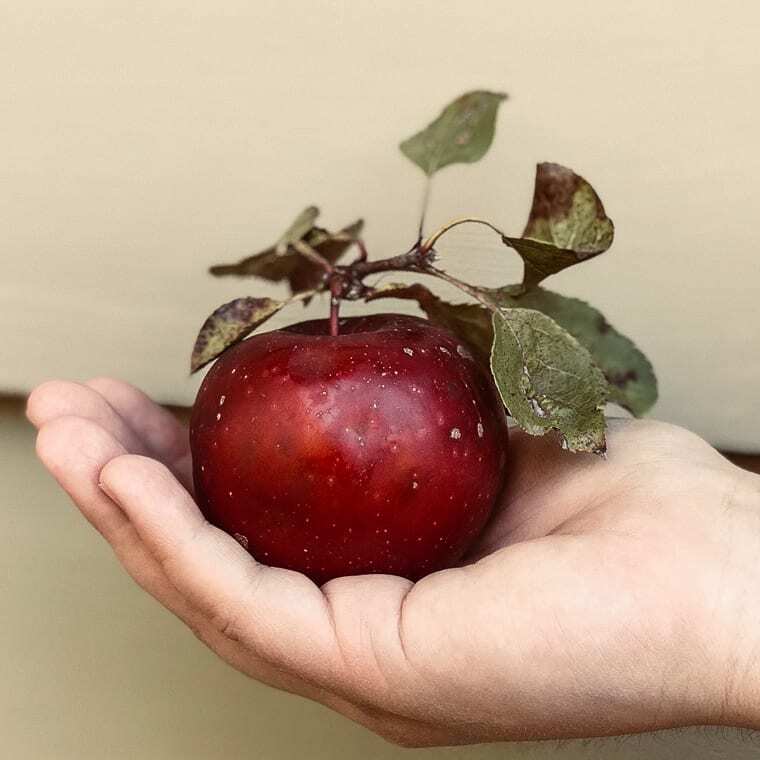 That apple looks so lovely. I never actually tried an apple butter before. I am so curious what does it taste like. I sure know its so tasty. I hope to try it soon. It tastes like a thicker, more spiced version of applesauce, Susie. You can moderate the flavor by adding more or less spices. It’s delicious on toast, biscuits, scones, etc. I just made my first apple butter this year and I love it. I have a friend with a bunch of apple trees and I always like to try new recipes. Thanks for the recipe. This looks beautiful Sue. I actually have had a batch in my slow cooker since about 8:00 this morning and wont be done until late this evening. It’s the perfect time of the year for Apple Butter – it’s so tasty! You know your apples! And your apple butter. Terrific recipe. And photos. And a really fun read. Thanks! We went apple picking this past weekend and it was such fun! I love this simple, and delicious looking apple butter, and I bet my grandchildren (and their parents) would love it too. Thanks for sharing and happy travels. I love apple picking, too, and I’ve never been to a farm where there were so many varieties, that was really special. For me, this is perfect. I always feel like apples are sweet enough and apple butter/sauce don’t need added sugar! 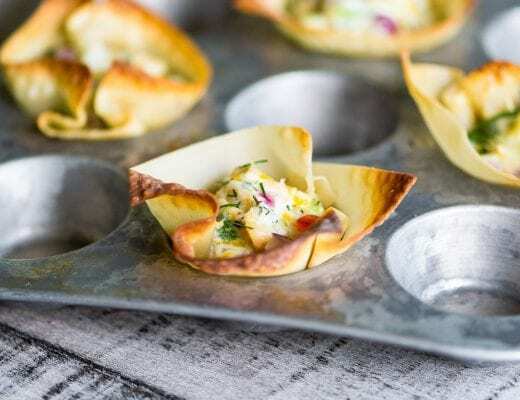 So I am delighted to see this easy recipe! This is definitely a change from the really dark spicy butters, but I think there’s something to be said for both! How fun that you got to be with your daughter. I know Wisconsin is beautiful right now. I was there at the end of September and the colors were just starting to change. The apple butter looks so silky smooth and I love that there’s not sugar! Thanks for all the ways to use it too! 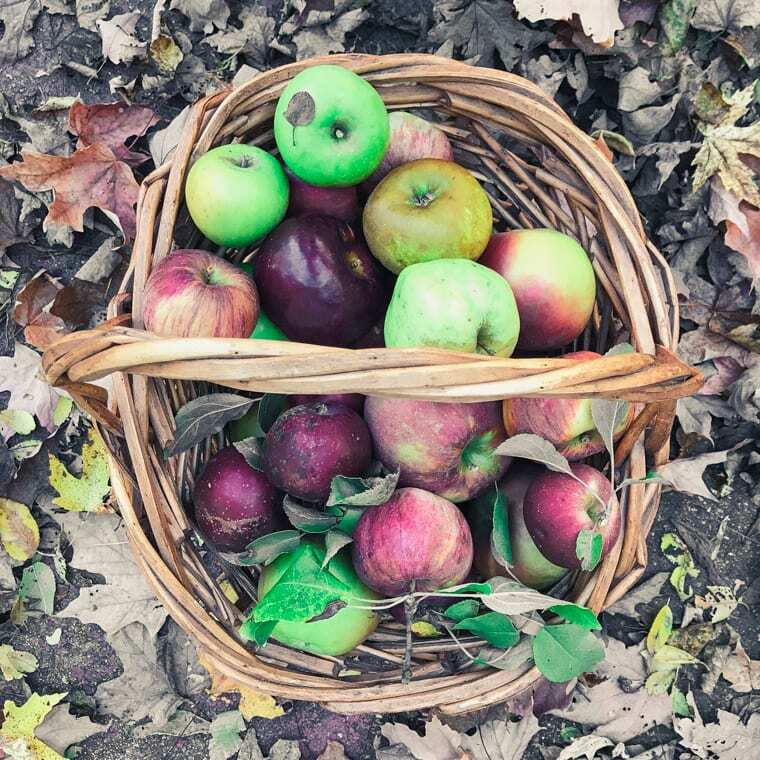 I love those freshly picked apples! Your apple butter looks so creamy.